Heat oven to 350°F. Grease 2-quart casserole with shortening or cooking spray. Spread potatoes in casserole. Pour sauce over potatoes. Cut remaining 1 tablespoon butter into small pieces; sprinkle over potatoes. Cover; bake 30 minutes. Uncover; bake 1 hour to 1 hour 10 minutes longer or until potatoes are tender. Let stand 5 to 10 minutes before serving (sauce thickens as it stands). What does “scalloped” mean? This is basically a classic French potato dish called potatoes Dauphinoise that is baked in an oval gratin dish. The starch from russet potatoes is a vital part of creating a thick, garlicky cream-based sauce. This recipe makes a lighter white sauce (a French-style béchamel) first, pouring it over the potatoes—making this a foolproof recipe. For an American-style gratinéed potatoes, stir sshredded cheese into the white sauce. Make it a sharp Cheddar or smoked Provolone—something bold that has personality. Salt is an important player, too, to balance the bland richness of a cheese sauce (a spoonful of Parmesan can do the same thing). Pan prep-grease or butter it well, as the sauce will brown and stick to the edges of the pan, making clean up a chore. Using a mandoline slicer makes it fast and easy to get uniform slices of potato. While Ireland and Idaho have their claim on potato’s past and current place in culinary lore, the humble spud actually originated in the Andes mountains of Peru and Bolivia. If you think we have lots of variety with our choice russet, red, white, yellow, purple, fingerling and petite, think again. In many parts of South America, more than 3,000 different varieties of the potato can still be found. For this recipe, you’ll want to stick with a sturdy variety that will hold its shape well, like a russet, which is sometimes labeled as a baking potato. 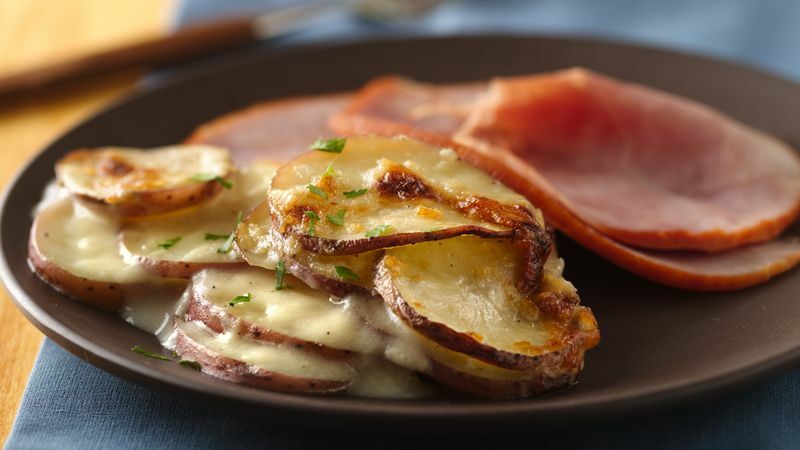 The “must have” inclusions for a scalloped potatoes recipe are thinly sliced potatoes baked in a rich, creamy sauce. After that, the sky—and your creativity—are the limits for your homemade scalloped potatoes. What can you add to make this dish uniquely your own? Browse through Betty’s best scalloped potatoes recipes for some thought-starters and inspiration.